I was very excited to get my delivery from the wholesaler today. With the superstorm I wasn’t totally sure things would run on time. I always love that feeling of Christmas that comes with deliveries – opening the box(es), digging through the packing peanuts for little treasures, and getting to check everything out up close. 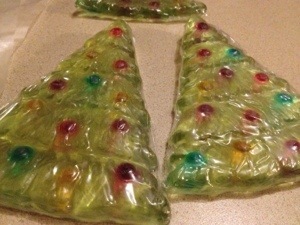 I am even happier to tell you that the shrink wrap that I ordered for the Christmas Tree Soap worked nearly perfectly. *happy dance* There is a bit of trimming that needs to be done before shrinking, but otherwise they are great. I had one little oops moment though. Apparently I got a little over zealous with the hair dryer (it’s oddly difficult to act like an adult when working with shrink wrap and even harder to be careful). I went to flip the thinnest tree and it felt weird. I had accidentally warmed a spot on the edge a bit too much and it started to melt! Whoa! I’ve set it aside to deal with later. It still works fine and it’s a tiny spot, but I don’t want to have it in with what I’m selling. I’ll either gift it or sell at a reduced rate…unless I decide to amuse myself by slipping bits of it into my husband’s other soap and make him smell like jellybeans. Lol. Okay, okay. There are a couple of things that make it difficult for me to act like a serious adult. *grin* Anyway, I had to share because I’m so pleased with how sharp they look. A little side note – I noticed as I was wrapping them that the hand painted ornaments have begun to bleed a bit, which is actually cool because it helped give a soft, even more Christmassy look to the soap. It reminds me of taking a picture of a real Christmas tree and the lights having that pretty halo around them when they’re lit. Woohoo! Posted in Soaps and tagged bath, Homemade, soap. Bookmark the permalink.